WILLEMSTAD - Agriculture, fisheries and livestock farming contribute less than one percent to the gross domestic product. That was announced by Minister Suzy Camelia-Römer during the press conference of the Council of Ministers. The minister wants the agricultural sector to grow by five percent annually. She wants to achieve this by working together with Adeck, the association for small and medium-sized businesses. An agreement was signed yesterday. There are currently fewer than 200 people working in the agriculture, livestock and fishery sector. In response to questions from the media, the minister expresses the hope that that number will grow by five percent and that there will be work for 2,000 people in ten years' time. Subsidies are given abroad for innovative and innovative projects in agriculture. The Minister indicated that one of her priorities is to set aside enough financial means to be able to invest in this important sector for the island. 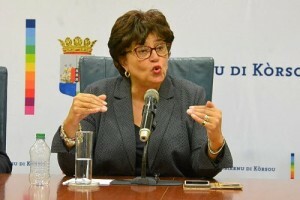 Curaçao must become less dependable on countries such as Venezuela. The only way to achieve this is to invest in agriculture, fisheries and livestock farming.